Update: Copenhagen Climate Change Conference (COP15) concludes with a non-binding Accord. The Online Citizen (TOC) speaks to 24-year-old Amira Karim. She is a member of the ECO Singapore delegation that attended the Copenhagen Climate Change Conference (COP15). She is also a World Bank Youth Fellow working on international development issues. At COP15, she made international news headlines for reprimanding rich nations for carbon colonialism. 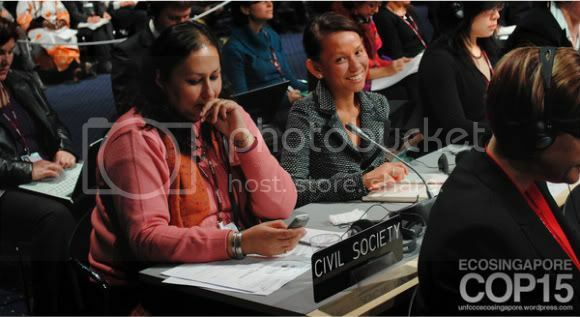 TOC: You recently addressed delegates at COP15 as a representative of ECO Singapore fronting Youth NGO (YOUNGO). What do you personally hope to achieve at the conference? Amira: Firstly, I want to learn, learn, learn. As a young person, I think it’s my responsibility to empower myself through knowledge. You can’t be a credible/legitimate expert or activist if you don’t know what you’re talking about because it will show and it will discredit you and your movement. Passion can only get you so far. Well-informed solutions, ideas and strategies are absolute necessary to further good intentions. I also hope to build stronger personal and working relationships with other NGOs so that the momentum we’ve generated at COP 15 is continued. There are many brilliant individuals and groups and therefore, wonderful opportunities to cross-pollinate ideas. Lastly, I’m very keen to garner a deeper understanding of the UNFCCC process and to be well-versed with the complex and fascinating mechanisms and protocols. TOC: In your intervention speech, you spoke of “carbon colonialism”. How should the UN and/or member-states respond to this imposition of might? Upholding these principles serves every country’s interest, big or small, and every country has a role to play to ensure it is maintained. While countries that have been sidelined will inevitably stand up for their rights, the UN also has a right to and in fact, must, take serious action against efforts to flout its rules and principles. Depending on the gravity of the breach,the UN is in a position to explore the possibility of establishing deterrent measures and penalties to discourage attempts to circumvent this process. TOC: Do you believe that alternative frameworks for climate change advocacy and action, such as the Asia-Pacific Partnership on Clean Development and Climate (AP6), will be able to foster agreement where the UNFCCC has been lacking? I think regional efforts like the AP6 and other plurilateral energy agreements are helpful and have a role to play in reinforcing the UNFCCC’s mandate to reduce emissions,and implement as well as providing financing for adaptation and mitigation efforts. More often than not, agreements involving fewer parties (i.e. bilateral or plurilateral agreements) are more focussed in specific sectors and are able to accommodate greater granularity in the form of more specific details. For example, the AP6’s focus on deployment of clean energy and technologies supports the very crucial efforts by the UNFCCC to reduce the emissions of developed countries and to assist developing countries transit into a low carbon growth pathway. TOC: What can smaller countries do to tackle climate change in a manner best suited to their socio-economic environment? Amira: I think each country has unique social, economic and environmental circumstances that will shape its policies. However, all countries must ensure that climate change policies are not only appropriate but inclusive. Policies must be crafted through the consultation and participation of affected communities, for example, indigenous communities, women, youth. TOC: What is your position on the role NGOs have assumed in putting pressure upon governments, ‘big business’ and other contributors to the climate change conundrum? Amira: I think NGOs play a key role in representing communities and interests that are often excluded from the policy-making process. They could potentially influence policies, offer new solutions or galvanise widespread support for disenfranchised parties/countries. Obviously, there are many ways that NGOs attempt to do these. Some focus on direct action (protests/demonstrations) while others prefer more discreet methods like promoting policy alternatives and lobbying. Ways to measure effectiveness also differ among NGOs: some believe that profiling an issue through demonstrations are an achievement while others may have more focussed goal in influencing policy. I believe that both tracks are potentially useful and effective as long as they support the negotiations and are not disruptive. The US Civil Rights era is testament to the fact that peaceful demonstrations have also had their place in history. On the flipside, NGOs have a great responsibility (as do governments) to their constituency and the public as a whole. I think it’s crucial that NGOs present nuanced arguments that are constructive so that they don’t discredit their cause. TOC: What motivated you to safeguard the interests of the environment vis-a-vis ECO Singapore? Amira: I guess my parents are to blame for instilling a keen love for the outdoors when I was growing up. 🙂 They’ve certainly encouraged my curiosity and interest in environmental issues. However, climate change is more than just an environmental issue, it involves issues of fairness, justice democracy and development. I’ve been noticing how the gradual inclusion of civil society perspectives in the COP process has played a role in guiding the negotiations. I felt that COP 15 would be a great opportunity to gain a first-hand understanding and make a contribution. TOC: Youths all over the world are becoming increasingly active in working to reduce the effects of climate change however possible. Why do you think this is so and is this indicative of a better future for climate change advocacy? Amira: I think youth recognise that climate change is a problem that they will inherit and that will impact their futures. They’re therefore interested in changing the course of their fates. I think it’s a positive development that young people are being so deeply involved in the policy process instead of being armchair critics and begrudging their fates. The greater the diversity of thoughts and ideas and the more deeply interlinked the youth are with each other, the higher the chances of creating solutions and generating cooperation and consensus when these youth become leaders. TOC: Do you see more Singaporean youths joining in the fight and what can they do to advance this cause? Amira: I hope they do! ECO has many passionate young volunteers and I am certain we will welcome more. “Joining the fight” can be done in many ways, from small but crucial efforts like educating people about ways to lead sustainable lifestyles, to assisting with recycling campaigns, to becoming experts on clean technology, to learning about and advocating issues at the international level. Singapore youth can begin by deepening their understanding and interest in the issue and coming up with ideas to propose and advocating these solutions to our policymakers and policymakers worldwide. TOC: How should Singapore’s government contribute to the climate change movement and what outcomes do you envision will result from the initiatives you think should be implemented? Amira: Singapore may be small but we can play a key role in consensus building in international issues like climate change because of our respectability and consistency. International politics can sometimes be like a prisoner’s dilemma: countries cooperate when they perceive that others will cooperate as well. Consensus breaks down when there is no trust among countries and every country, no matter how small, has a role in reducing the risks in cooperation. Moreover, given that Singapore has played an excellent role in facilitating dialogue and strengthening cooperation in many other fora like ASEAN and APEC, Singapore could similarly assist the UNFCCC in this manner. Details of ECO’s position on Singapore’s role, including our hope for Singapore’s emissions reduction targets, can be found here. TOC: How did you feel about receiving that hearty applause after giving your speech; what do you think the significance of receiving such a reaction means pertaining to the attitudes of delegates to eradicating carbon colonialism was? Amira: It was definitely unexpected! It was empowering to have our team’s contribution acknowledged but at the same time extremely humbling to realise that you have, in some small way, become accepted into a larger community that needs to work together to solve one of the most pressing issues of our time. It also indicates the willingness of the delegates to listen to youth perspectives and demonstrates that perhaps the threat of “carbon colonialism” is a concern they also shared. It’s an honour that carries the weight of a fair amount of responsibility so I will definitely take home the inspiration I received from that moment to translate into concrete post-COP 15 initiatives.